Everyone needs a little Stardust. Winner of 9 National Parenting Awards! Stardust is a unique collection of traditional and original lullabies for young and old alike. Superb, rich sibling vocals interwoven with masterful instrumentation bring each song, each story, to life! Let award-winning singer/songwriters Cher & Gene Klosner guide you on a soothing musical voyage, featuring over 2½ hours of relaxing music for moms, dads, kids & grandparents! Cher and Gene bring superior musical quality and a human touch provided by authentic instrumentation, guiding each lullaby into smooth, effortless compositions, making this the perfect gift for easy nights of sleep and rest. Cher & Gene Klosner blend their lilting voices into light orchestral, acoustic and warm jazz settings in this original 2-disc music collection. Let Stardust encourage the ritual of singing a bedtime lullaby, while calming your child to sleep. Each CD contains instrumental tracks to make it easy to sing to your child, or simply for the pure joy of singing! Treat a special child, grown-up or yourself with the gift of Stardust! You’ll wonder how you ever melted into peace without it. We are very excited to present our first video from Stardust. Animated by the super talented Pascal Campion. The video even received a nice little mention at the Flash animators blog Cold, Hard Flash. Hi friends! Help us tell Oprah about Stardust! If you like Stardust, and think it would make the perfect gift for the expecting or new mom (or Dad or Grandparent! ), click here – help us make Stardust one of Oprah’s Favorite Things for baby shower gifts! 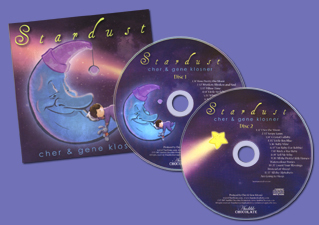 Be sure and mention the title (Stardust) and the artists (Cher & Gene Klosner), and that it is a brand new CD! Thanks, everyone! We’ll keep you posted! Join our email list now to find out about upcoming performances and new releases! Quality music that parents will love and kids won't outgrow!